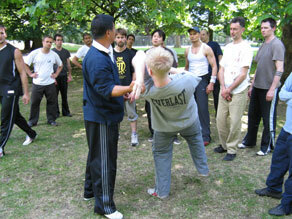 This seminar with He Jinbao is the ideal opportunity to learn Bagua from the fifth generation lineage holder. The focus will be on lots of training and practical applications of the syllabus. He Jinbao is a very patient teacher and welcomes beginners. For a detailed timetable of the activities please download the PDF. This event is open to beginners; no previous experience is required. For more information please contact Philip Smith by email philip.smith@yinstylebaguazhang.com or call 07546 152731.